Fabspeed Motorsport has always offered an industry leading limited lifetime warranty to original product purchasers, but now it's one of a kind. We are very pleased to announce that Fabspeed's warranty is now transferable to secondary and all subsequent owners of Fabspeed exhaust systems and components. This unprecedented change in policy came from feedback received in the exotic car community and we are excited to implement. We have always backed products for original owners, but now we're proud to extend the same support to all. This warranty transfer opportunity sets Fabspeed far above ANY other aftermarket company. NO other company or manufacturer of exhaust components for exotic cars stands behind it’s product line like Fabspeed. Compare our warranty to some other industry leaders. There will be a ONE TIME service fee of $249 in order to transfer the warranty, which then covers the product for as long as you own it. Though we are extremely confident in our products, even the initial process of transferring a warranty uses a variety of resources on our end. The service fee is to cover this process. The warranty transfer process is simple. If you own a Fabspeed product and are not the original purchaser, get started by filling out a customer service form with the button below. Below is the Fabspeed General Warranty, which goes into effect should there not be a specific product warranty included with your purchase. A performance car is only as strong as its weakest link. Therefore, it is vital that you maintain your vehicle to factory specifications. By installing or using the purchased product, the Consumer accepts this warranty and any specific Manufacturer warranties enclosed. This warranty coverage is superseded by any warranty policy the product contains stating otherwise. The Manufacturer’s full warranty applies to all products sold. Fabspeed warrants our products to the original retail purchaser (Consumer) against defects for the life of the product. This is an exception to the use of Sport Catalytic converters, which only hold a 2 year warranty and are covered for street use only. Aftermarket catalytic converters are not warrantied under race conditions. Fabspeed will not warranty any catalytic converter that is used with leaded race fuel or any type of fuel additive. Lead and certain fuel additives will damage any catalytic converter whether it is stock or aftermarket and Fabspeed will not warranty nor be responsible for any costs incurred for repairing or replacing the catalytic converters used in racing or motorsports applications. Fabspeed will evaluate any failed catalytic converter(s) and make a final decision on how and why the catalytic converters failed. If leaded race gas or fuel additives were used then replacement of cats will be charged to customer. Exhaust systems used in Speed/Competition/Road Racing and Off Road use have a propensity to fail over time. Cars subjected to these extremes require extra maintenance and caution, and Fabspeed is not liable for any catalytic converter failures under these circumstances. Upon verification of warranty coverage, Fabspeed will, at its sole option, repair or replace the defective product without charge. This is the only remedy the Consumer has for any loss or damage, however arising, due to nonconformity in or defect of the product. This warranty does not cover consequential damage, loss of time or revenues, inconvenience, loss of use of vehicle, shipping, damage to the vehicle or components, or other incidental or indirect damage. All warranties are void if the product was not installed by a certified auto mechanic, improperly serviced, modified, or used in a way not intended by the Manufacturer. The Consumer is responsible for ensuring that the product is installed in a safe and proper manner, and should cease usage of the product immediately if an unsafe or improper condition is noted. If an unsafe or improper condition is noted, the Consumer should then immediately contact the facility where the product was installed or Fabspeed. If you feel that you need to return a product, see our return policy and procedure. Or, feel free to contact us first for any warranty claims questions or explanations of this section. Customer is entitled to return non-customized, non-special order, products within 30 days from the date of delivery. This is separate from returns for manufacturer defect, as covered within Warranties Section of Fabspeed Motorsport website. To qualify for return, the product must be unused and remain in undamaged and sealed original packaging, as well as match the current design and packaging for the product at the time of return, unless otherwise stated with product or within the warranty page of Fabspeed Motorsport Site. Sounds is subjective and therefore does not qualify for a return of a used product. Periodically something may be incorrect on a shipment due to a customer ordering incorrectly or a wrong part was shipped and you may wish to return an item. We will do everything reasonable to satisfy you. Please immediately contact Fabspeed via email or phone to discuss the circumstances before returning any products. Anything returned without prior authorization from Fabspeed Motorsport will be refused. Any and all returns must be sent back fully prepaid. Our customer service department (service@fabspeed.com) will issue a Return Authorization Number, which must accompany any return. A copy of the original invoice and a brief explanation must accompany all returned items. No returns accepted after 30 days from the invoice date. No credits given after 30 days. It is the right of the customer to cancel any order up until the time that the order ships. Cancellation fees may be assessed, and will be determind on a case-by-case basis. Once the order has shipped, any cancellation requests will be treated as a product return, and may be subject to re-stocking fees. No cancellations will be accepted on orders that include custom or made-to-order parts once work has begun on the specified parts. Any refunded payments - in part or in full - are payable solely at the discretion of Fabspeed Motorsport. All goods remain the property of Fabspeed until full and final payments have been received. Fabspeed Motorsport reserves the right to cancel or refuse orders for any reason and at any time, at our sole discretion. Fabspeed Motorsport not liable for refusal of, delay of, loss of or damage to a shipment of any item. The customer agrees to indemnify Fabspeed Motorsport for any and all costs, fees and expenses Fabspeed incurs as a result of any violation of any local, state, federal, national or international laws or regulations. Customer agrees to take responsibility for lost packages that were not independently insured, or sent without requiring signature. The customer understands they will be liable in the event of additional fees, tariffs, or legal issues such as border seizure. Customer accepts these risks and agrees to release Fabspeed Motorsport of all liability. Fabspeed Motorsport reserves the right to charge a handling fee on every order being shipped from our facility. This fee is universal and applies to all retail and wholesale purchases and cannot be waived or credited. A 6% sales tax will be implemented for every purchase made by a Pennsylvania resident. This fee will be charged for in-house installations and products purchased online, over the phone, and/or via email, this fee is non-negotiable and non-refundable. Fabspeed Motorsport utilizes only the best German-imported 200-cell per square inch catalytic converters in all of our Porsche, Ferrari, and Lamborghini applications. Our sport catalytic converters will pass emissions and inspections in all 49 U.S. states other than California. All sport catalytic converters are sold for offroad use only to California residents. 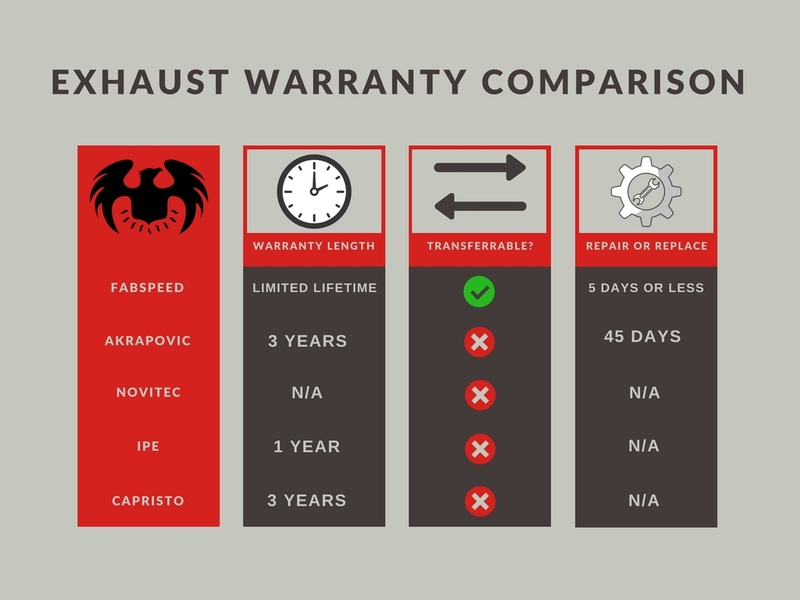 Fabspeed sport catalytic converters have a limited TWO (2) YEAR WARRANTY from date of purchase. Fabspeed Motor sport reserves the right to charge a 25% restocking fee on any opened box item. Returns over 30 days after invoice date. No returns unless prior approval. Please check your order thoroughly upon receipt and contact us immediately with any concerns. Unauthorized / Other Returns: Please contact us for a Return Authorization Number. Returns received without an R.A. will be charged a restocking charge. If an order was shipped with free shipping, and the order is the returned, we reserve the right to charge the customer for the original shipping. Return shipping charges from the customer to us will only be credited in circumstances of warranty or incorrect shipment. Should any package appear to be damaged at the time of delivery, Fabspeed Motorsport must be notified within 5 days and a claim for damage must be made promptly with the responsible freight carrier. Fabspeed Motorsport shall have absolutely no liability in connection with the website content including any liability for damage to your product resulting from the information or the lack of information available on the Fabspeed website. Any loss or injury caused, in whole or in part, by its actions, omissions, or negligence or for contingencies beyond its control, in procuring, compiling, or inaccuracies in correlating to the site material. In no event shall Fabspeed Motorsports be liable for any for any special, incidental, consequential, exemplary or punitive damages for any loss or profits, goodwill, use or other intangible losses including negligence, whether remote, proximate or foreseeable, and whether or not Fabspeed Motorsport has been advised of the possibility of such damages, arising out of or in connection with the use of our products. Fabspeed offers a Limited Lifetime Warranty on all of our performance products*. This Warranty is offered to the original purchaser and protects against defects in materials and construction. If the product(s) should ever have a problem, the original purchaser must contact Fabspeed immediately to submit a Warranty Claim. Fabspeed is not responsible for any costs (including parts, labor, shipping required for service and miscellaneous) incurred by the customer for Warranty service. Fabspeed does not offer Warranty coverage of sound quality as this is subjective. Excluded from the warranty transfer program are catalytic converters, tuning products, third party products that Fabspeed sells. Fabspeed products containing catalytic converters are protected by a 2-Year Limited Warranty against failure or defects in material and construction. This Warranty does not apply if the product(s) has been installed on a vehicle that has been run with leaded race fuel or fuel additives. Catalysts must not show any physical damage or signs of abuse. Signs of abuse include, but are not limited to, motorsport or on-track use, leaded fuel, fuel additives, etc. Catalysts must be no more than two years in age from original purchase date. There are no visible exhaust leaks anywhere in the exhaust system upstream of the catalysts. Two ECU printouts showing catalyst inefficiency faults. After the first printout the ECU fault memory is cleared. If the fault returns, a second printout should be made and submitted for warranty approval. Printouts must include operating conditions and vehicle hours. A graph of the oxygen sensors before and after the catalyst must be supplied. This graph should show the oxygen sensors in operation on a fully warm vehicle in closed loop operation. Components and parts not made or manufactured by Fabspeed Motorsport (third party) are not covered by the Fabspeed Limited Lifetime Warranty and default to the respective manufacturer's warranty program. We often get asked the question, "If I fit a Fabspeed Motorsport exhaust to my car, will it invalidate my manufacturer's warranty?" According to the law, the answer is an emphatic "No". However, many people including vehicle suppliers themselves, do not know this and supply the wrong information. In October of 2003, European Union legislation affecting the motor trade came into force. Its full title is 'Block Exemption Regulations 1400/2002' (in short 'BER'). This legislation changes the way cars may be serviced and repaired, and gives motorists a lot more freedom in their decision about who should look after their cars. The BER covers areas such as who can service vehicles other than agents appointed by manufacturers and, more specifically to customers who are considering a Fabspeed Motorsports exhaust, parts that can be fitted to a vehicle. Below we draw upon in particular the issues that concern fitting replacement parts to a vehicle that are not the manufacturer's original equipment. Where parts manufacturers/suppliers are able to issue a quality certificate. Fabspeed Motorsports exhausts are compliant by the strict guidelines and internationally-recognized ISO 9001. Very few aftermarket exhaust manufacturers have such certifications. An interesting point is that if the vehicle manufacturer itself offers spare parts of differing quality (e.g. an "economy" or "premium line"), he cannot prohibit its contractual partners (i.e. dealers and authorized repairers) from buying spare parts of the same quality from the independent market. The BER also covers service and maintenance during the warranty period and prohibits vehicle manufacturers' warranties from including conditions requiring that all parts used must be the VA's "original spare parts". THE EUROPEAN COMMISSION DECLARED THAT SUCH CLAUSES IN A WARRANTY DOCUMENT WOULD REPRESENT "AN UNJUSTIFIED RESTRICTION FOR THE CONSUMER". The products sold by www.fabspeed.com may not meet noise and emissions regulations in your area and are meant for off-road use only. You are responsible for knowing and complying with local and federal regulations if you plan on using them on public roads. California has particularly stringent regulations regarding aftermarket automobile parts that have the potential to impact emissions. In most instances, the sale and/or use of emissions related aftermarket parts on motor vehicles is prohibited unless it is either a "replacement part" as defined by California, or is a specifically authorized use of that part as reflected in an Executive Order ("EO Part.") Fabspeed exhaust systems for automobiles mounted downstream of the catalytic converter (also known as "cat-back systems ) are considered "replacement parts" in California by the California Air Resources Board (CARB) and do not require an exemption or executive order from CARB to be sold in California. California prohibits the use of any aftermarket exhaust system which modifies, removes or replaces original equipment catalysts, unless CARB has issued an Executive Order as to such part or system. Such systems are considered "Competition Use Only Parts" that replace or otherwise interfere with the operation of an emission control device, such as a catalytic converter or oxygen sensor, and may be sold and used on an automobile that is used only for closed course competition.